New Public Entity Game Plan: Unbundle HR Administration Contracts and Save! 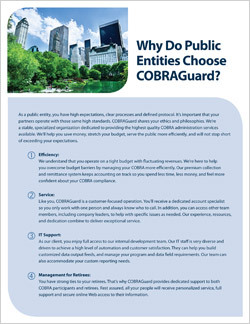 If you’ve seen our recent press release, you already know that the North Carolina State Health Plan Board of Trustees recently awarded benefits administration contracts to five companies, including COBRAGuard. The state provides benefits for approximately 664,000 people. With this decision, it expects to save $22.4 million, roughly 19 percent, compared to last year.